NumberTwoSon has attended Ringling College of Art and Design and The Art Department. He has met many artists and has seen a lot of documentaries about artists. So when he says For No Good Reason is the best documentary of an artist he has ever seen, it’s a Ringing endorsement. He was especially impressed with the production values–specifically the way the art was animated and presented. While the iconic work of Ralph Steadman is some of the most instantly recognizable in the world of modern cartooning, the artist himself states that he is often dismissed as just a “cartoonist” and not seen as a “real” artist. That perception, if it is indeed true, is shattered by this spectacular documentary that chronicles his life and art. 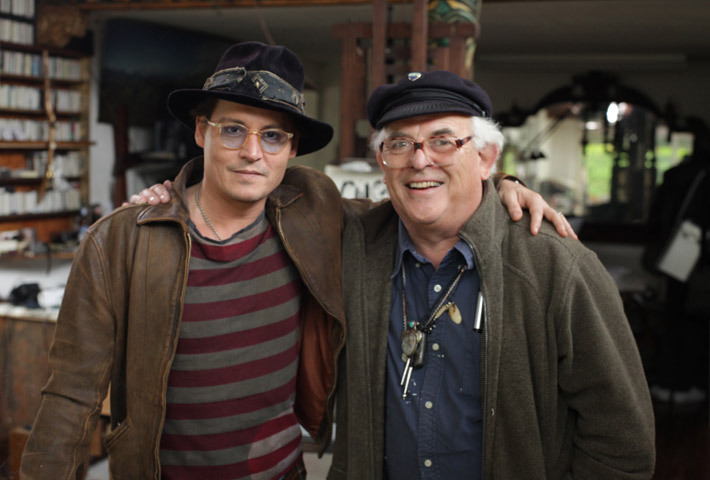 It feature Johnny Depp, who starred in the movie, Fear and Loathing in Las Vegas. Steadman was asked by Hunter S. Thompson to go with him to Las Vegas and help illustrate a story he was writing for Rolling Stone magazine. The resulting kaleidoscope of drugs and crazy adventures led to incredible art pieces and journalism that became known as “Gonzo” journalism. An article in Rolling Stone and the movie by filmmaker Terry Gilliam (who also appears in this documentary) helped to further heighten the notoriety of this remarkable artist. Before the film, I was speaking with a member of the Enzian staff and they said that, in some ways, Ralph Steadman was crazier than Hunter S. Thompson because he did all these antics while he was sober. The documentary does an exceptional job of exposing the creative process that Steadman goes through when creating his works of art. Superior animation techniques then bring some of his artwork to life. Through it all, the artist himself reveals a fascinating character who is modest and self-effacing in the light of a prodigious body of well respected work. His opening salvo, that his goal was to help change the world, was tempered at the movie’s end by his musings that perhaps he and his generation really failed humanity. While Grammy LanceAround found the movie to be a bit confusing, Mrs. LanceAround, NumberOneSon and NumberTwoSon spent the entire car ride home discussing the movie in depth. It was clear that they were very touched by this chronicle of a man who created many iconic images for generations of Americans yet finds himself questioning his own contributions. Very well done and worth seeing! This entry was posted on April 6, 2014 at 3:09 pm and is filed under Art Community. You can follow any responses to this entry through the RSS 2.0 feed. You can leave a response, or trackback from your own site.